Leading up to the annual ‘sugar beet campaign’ in the autumn, sugar beets are trucked and railed by the tonne to the production plants of AGRANA Zuckerruben GmbH in Leopoldsdorf near Vienna every day. With a payroll of 8,800 employees and plants in 55 countries, the AGRANA Group is one of Europe’s largest sugar producers and is a leading global supplier of fruit preparations and fruit juice concentrates. To this end, the organization not only manufactures products for further industrial processing, but also markets its own line of goods for end consumers under the ‘Wiener Zucker’ label. action, freight wagons were handled by a rope conveyor. Years of stress induced by the water, however, combined with the ever increasing number of carriages and payloads, eventually took their toll on the stationary system, which could no longer cope effectively. The answer came in the form of a Vollert-designed shunting robot, which has been unloading sugar beets since September 2014. 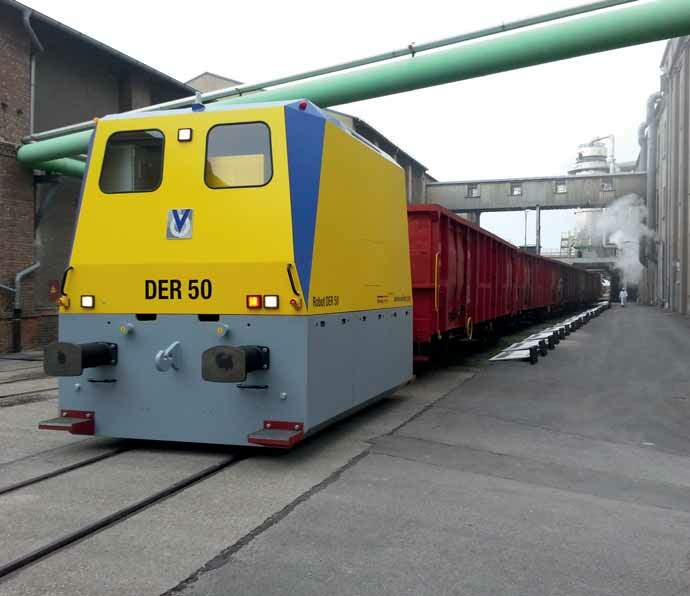 The DER 50, as it is known, is the venerable classic among the many models available and has a rated tractive force of 50kN and an operating weight of 35 tonnes. Equipped with an automatic shunting coupling, workers no longer have to be bothered with manually coupling and uncoupling the carriages in the drenched unloading area. The operator simply lets the robot perform all activities fully automatically or can assume manual operation via the remote control facility in the control cabin at the unloading station, where the water jet is also guided. Robust mechanicals allow the DER 50 to be operated in almost any weather imaginable, including high temperatures, low temperatures down to minus 60°C, as well as snowy and icy conditions. The shunting robot is also used by the agricultural industry to load corn and bioethanol.